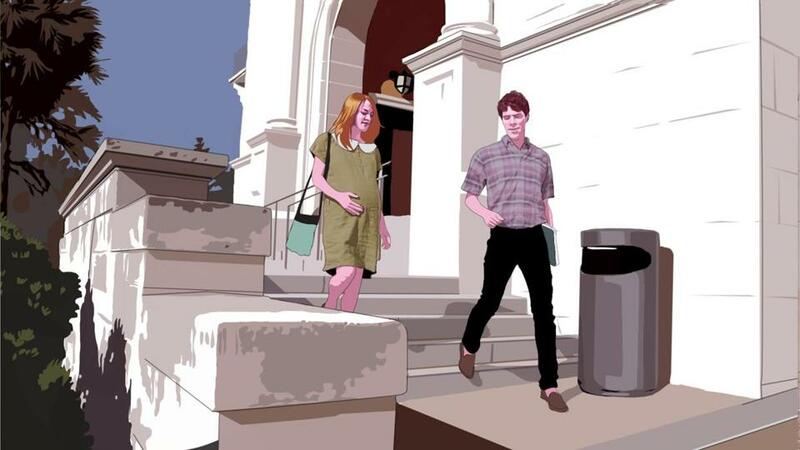 The film’s style involves rotoscoping — taking footage of actors and drawing over them manually and digitally. There’s a moment about three-quarters of the way through “Tower” that took my breath away — and I was already holding my breath. I won’t tell you what it is, because when you see Keith Maitland’s bravura documentary, you’ll know. All I’ll say is that things suddenly get real. Of course, it’s worth asking if “Tower” qualifies as a documentary in the first place. It re-creates that awful Aug. 1, 1966, when Charles Whitman climbed the University of Texas Tower building in Austin with a suitcase full of rifles and killed 14 people and wounded 32 others before being shot to death by Austin police officers. The tragedy, incomprehensible at the time, was a harbinger of our modern plague of gun massacres — an outlier of calamity. Bizarrely (or so it initially seems) Maitland and artist Craig Staggs have chosen to replay the tragedy by animating it in the rotoscoping style employed by Staggs in Richard Linklater’s “A Scanner Darkly” (2006) and elsewhere. The technique uses footage of live actors who are then drawn over both manually and digitally, and it can create an uncanny sense of presence — a sort of augmented reality. It’s not a gimmick if it works, and “Tower” works unnervingly well. The film is essentially an oral history, with firsthand accounts from those who were there — survivors, responders, and onlookers — with their words read by younger actors. The aim is to dramatically re-create the year, the day, the horrific event as it grew from rumors of gunfire to a one-man assault on a city. Maitland and Staggs dramatize those firsthand accounts but they’ve also rotoscoped the archival footage, weaving in radio and TV coverage as reporters come to grips with the scale of the attack. It’s a wholly convincing mosaic that makes you temporarily forget about history’s long view. What’s most striking is the witnesses’s disbelief about the carnage exploding around them. This isn’t supposed to happen here, in America, and yet it is. We know that now, too well. “Tower” is, in a sense, about the last day of this country’s innocence, or whatever was left of it after Dallas, 1963. We also come to know some of the people well, or seem to. Perhaps the most heartbreaking story is that of Claire Wilson, 18 years old and eight months pregnant when she and her husband, Thomas Eckman, were shot as they crossed the plaza beneath the UT Tower. Eckman was killed instantly and Wilson lay on the hot pavement for hours, rescuers helpless to approach as Whitman shot at anyone who moved. Among the most overpowering moments of an overpowering movie honor the one young woman who dashed out and laid by Wilson’s side, keeping her talking and conscious. We meet Allan Crum, a middle-aged clerk at the UT Co-Op who wandered out to see what the noise was and ended up accompanying police officers Houston McCoy and Ramiro Martinez to the observation deck of the tower for the final reckoning. We meet John Artly Fox, who’d just graduated from Austin High and heard on the radio that something was going on downtown, the arc of chance and nerve bringing him in line with the wounded Claire Wilson. We meet the Hispanic kid who got picked off his bike, and the UT student who never forgave herself for cowering inside in fear. We meet everybody except the gunman, Charles Whitman, who remains unseen, unanimated, unknowable. Whatever moved him to kill other people to feed his fury is the next day’s mystery, and “Tower” is about the day of. Until that moment I mentioned up above, in which Maitland suddenly telescopes time, history, memory, and gratitude, and deposits us blinking with the survivors into the present day. The final passages of the film feel a little slack and sentimental compared to the earlier high-wire tension, but you could argue that emotions always come bursting out in the aftermath of disaster. Much more importantly, “Tower” reminds us of a time when the news of a dozen random people dead at a gunman’s hands was as unthinkable as it always should be.